In a previous post, When Done Actually Means DONE, I shared a slide that I’ll present at Agile2011. I use it to illustrate the differences between waterfall and agile development models in the context of hardware development. After posting that, the first response I got was examples could maybe make it even clearer from AgileSoC guest blogger @rolfostergaard. In case you haven’t read When Done Actually Means DONE, I’ve included the slide I used to get things started again in this post. I use it to show that there are different ways to describe how done you are based on the development model you’re using. If you’re basing progress on tasks you’ve completed, you’re using done to measure progress. If you’re using features, you’re using DONE. What’s the difference? Being done means you’ve hit a milestone that won’t hold water mainly because there’s no way to objectively measure its quality. You may think you’re DONE, but without tests or some other reasonable way to measure quality, you’ll very likely need to come back to it. For that reason, done is misleading and it gets people into trouble. DONE means you’ve hit a milestone that you can unambiguously quantify (or at least quantify with far less ambiguity). Here, you’re confident that what you’ve just finished will require very little or no follow-up because you can see and measure results. In short, done isn’t done at all… but DONE is. Confused? Here’s where a few examples might help. Classic. Your design team is under pressure to meet a scheduled RTL complete project milestone. As always, it’s a high visible milestone – to the development team, management and possibly even customer – because it comes with the connotation that the product is nearly finished… save for the minor details that it hasn’t been verified nor has it been pushed through the back-end. The RTL is done though, so that’s great. Cross it off the list! This is a close second to my RTL is done. Your verification team has finished its test environment and supposedly all there is left is writing and running tests. Though of course there’s been very little to confirm that the test environment does what it is supposed to do. That’s immediately obvious when running the first test: the configurations are invalid, the stimulus transactions are poorly formed, the BFMs don’t obey protocols and the model is outdated; all unfortunate because now people are anxiously expecting results that the environment can’t quite deliver yet! Sure the test environment is done… except for everything that doesn’t work. Now we’re getting somewhere. No, your RTL isn’t done. No, your verification environment isn’t done. But who cares! You have something better: a small portion of both are DONE and that’s enough to run tests and collect coverage results that verify feature <blah> is ready to go. No ambiguity there. The feature works and you have the passing tests to prove it. You’re delivering something that’s DONE. A hardware team normally implements an API according to a spec received from the software team. After the hardware team is done, it’s assumed that sometime later the software team will build drivers and applications on top of the API and release the finished product. Problem is, the initial API was a best guess from the software team and early in their development, the team finds that the API that’s been sitting done for a couple months doesn’t give them the access to the hardware that they need. Sure the API was done, but until it’s updated, system performance is seriously restricted and some functionality is completely absent. 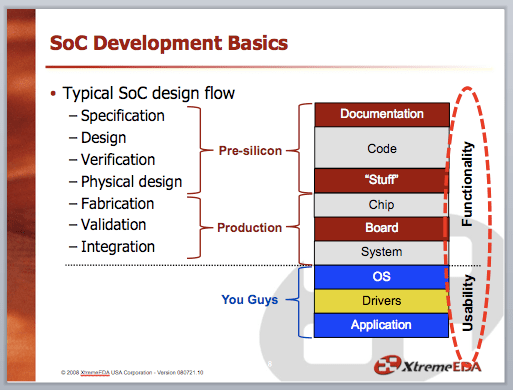 An SoC, by definition, is a part hardware, part software solution. So why settle with an API that’s done when the software is required for delivery? As the hardware team completes API functionality, give it to the software team so they can actually use it. Deliver it as a C model, an emulation platform or some other form that makes sense. Use this demo version of the entire solution (hardware + software) to judge whether or not you’re DONE. I’m going to try and follow my own advice on that one :). Done is a false milestone. It’s ambiguous. It’s one dimensional; you may have written some code but that’s it. There’s no reliable way to measure done and teams that measure progress in terms of done eventually find they’re not as DONE as they thought. DONE on the other hand, comes with results. It’s multi-dimensional; you’ve written some chunk of code and it’s been tested so you know it works. DONE is measured in passing simulations, software demos and any other means that objectively confirm the code you’ve written is high quality. Teams that measure progress in terms of DONE know how far they’ve come and how far they have to go. Done is a feeling. DONE is progress. Q. What examples of done do you see in SoC development? 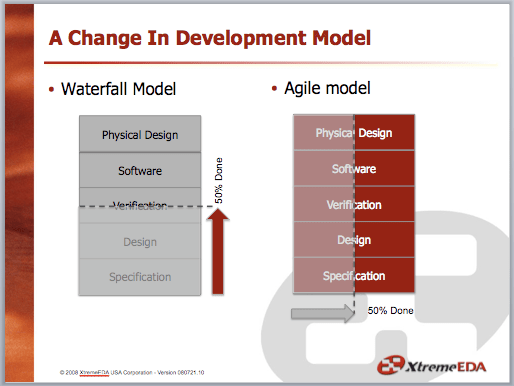 Applying Agile To IC Development… Coming To A Webex Near You! “Applying Agile To IC Development… We’re Not That Different After All” is part of the program for Agile2011, Aug8-12 in Salt Lake City, UT. I do plan to make video available to www.AgileSoC.com visitors… but video never seems to be as good as the real thing! Far too often technology projects leads to a lot of fun work with very low productivity – and less useful results. A demo-driven scrum-like approach is a good way to fix that. Let me start by describing what I term a “technology project”. Most development is directly focused on building a product. Often with a lot of focus on cost price, schedule, manufacturability etc. Risk is avoided and solutions that fit the cost and schedule with low risk are preferred. A technology project is intended to take more risk, do something new, and do this in a setting where the development of new technology is the goal. This is done outside of product development projects, to make the risk acceptable. Done right this actually reduces the risk of one or more following projects, where the technology can be used in new products. Most engineers love technology projects. For the same reasons, managers often use them to create variation in the work for the engineers. It’s like a treat for engineers. Sounds a bit nerdy, I know. But it works. The problem with many technology projects is that they can feel less important than “real” product development. But the contrary is true, they are more important. Without technology projects, the innovation suffers and new revolutionary products become to risky to do. Our solution to this is a scum-like approach with demos. Each 2-3-4 week iteration, should demonstrate something. Preferably physical and preferably progress. The mantra here is “show, don’t tell”. Sometimes it requires a lot of creativity to “show” something that can’t be build as a physical object yet. But eventually it gets there and the demos become more and more interesting. At other times the progress is negative – we are in a dead end and need to dig ourselves out again. That’s good too, because the cost of doing this in a technology project is much lower than in a tight product development project. That is risk reduction at work. We would prefer to always hold the demo, regardless of the results. “Negative progress” requires more understanding from all stakeholders – and a demo is really a good way of getting everybody to understand. If you read about Scrum and demos, you will hear a lot about how important it is to demo the real working product in a realistic user setting. I think this is besides the point here. For projects involving hardware, software, FPGA/ASIC, mechanical and other aspects, this may be completely unrealistic. Making a demo – any demo – is however always possible. And this is much better than not trying. More about making a demo, any demo will be discussed in a subsequent entry. Part of the purpose of a demo is collecting feedback. Both from other engineers on ideas for improvement, potential risks, things to try, test conditions to consider and from the other stakeholders on where the value is, what would improve the solution etc. Most technology projects tend to have one or two applications in future products as their primary targets. Holding regular demos is a also a really good way to get other application ideas identified as well. When a broader group get to see what can be done with this technology, feedback in the form of “Could this be used for…?” is inevitable. This is a good catalyst for further innovation. This method of making progress very visible and forcing easy to understand demos throughout a project helps in many ways. Does it make the project more agile? I believe so in many ways, but that may not be the primary reason for doing it. The more important reasons is to keep focus on the projects actual results and to make the project more visible. A very nice side benefit comes from the way motivation works. If you are doing something that matters to others (and hell yes, we want to see a demo – anytime! ), you are immediately much more motivated. Motivation improves productivity dramatically. Hopefully this served as a bit of inspiration on how to improve outcome, productivity and motivation in these traditionally difficult technology projects. Q: How do you make technology projects visible and productive in your organisation? Rolf V. Ostergaard is a M.Sc.EE from Denmark, who got his entrepreneurial inspiration by working in Silicon Valley back in the dot-com days. 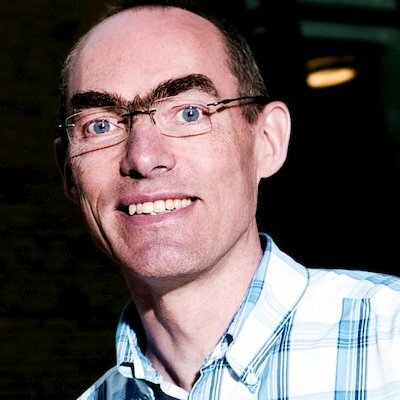 He co-founded the consulting business Axcon in 2004 and grew it to 20+ people focused on improving development of embedded systems – hardware, software, FPGA – the guts of smart devices. Rolf is specialised in signal integrity and enjoys doing training and consulting to fix SI problems before they occur. Find him blogging on www.axcon.dk/blog and as @rolfostergaard on Twitter. I’m at the start of a new project. We’re currently determining what features are needed in the end-product. This has led to me to thinking a lot lately about how to capture, prioritize and track the completion of these requirements as we progress through the project. Of course, I want to do this in an ‘agile’ way. As a <type of user>, I want <some goal> so that <some reason>”. It captures the who, the what and the why of a feature – providing some essential context to the assist in the implementation, validation and acceptance of a feature. User stories are then typically split into progressively smaller use-cases, or tasks until you establish a firm understanding of what the feature is supposed to do, and how your team is going to complete the functionality as the user expects. I found Cohn’s template particularly effective when creating some tool or script that I needed to create because it is much easier to comprehend than a typical requirement statement of “The system shall….”. But… if there’s one aspect of agile that I really think is difficult to translate into an ASIC/FPGA world, it’s the concept of user story. Perhaps it’s because I simply don’t have the experience in writing user stories. But I think it has more to do with my trouble in writing an ASIC story from a user’s perspective. In many cases, a feature does not even provide any meaningful output that is visible to the user e.g., some esoteric standards requirement about how an interface must be defined. Then serendipity came through for me, when my former colleague and AgileSoC collaborator Neil Johnson was in town on vacation and wanted to grab a beer. He knew James Grenning , who happened to be in Ottawa at the same time to deliver some training, and invited him along too. I’ll cut it short by saying I had a very intersting conversation with James and Neil. You see James is an expert in Test Driven Development for embedded systems. In fact, he’s written a book on the topic Test Driven Development for Embedded C. It was very interesting to discover the similarities that exist between embedded system design and SoC development. Including the perceived and real barriers to adopting an agile flow in an embedded design. To cut to the chase, we got to talking about user stories and how they don’t really fit into the ASIC development, when James suggested that he calls user stories “Product Stories” instead. While its a simple semantic change of “user” to “product”, for me it was a lightbulb moment. It helped me identify the issue I’ve been having with ‘user stories’: I’m not implementing something for an end-user; I’m developing a product that will fit into a larger system that will ulimately be seen by a user. (the what) A short descriptive story explaining the behaviour at a high level. simple set of acceptance tests to prove that behaviour is correct. I’ve been developing the following template, that I’ll be considering to use for my Product Stories, which is similar to the ‘user story’ template above. “The <context> needs to <do some behaviour> so that <some reason> “. A product story provides some clear guidelines on the functionality expected, as well as a clear indication of what coverage points must be captured before you declare the product story complete. In fact, I think it might be a good idea to stating these acceptance criteria as functional coverage points. As I work through these concepts in my head, I’ll attempt to describe them in in my next few blog posts. I’ll talk about how I see these Product Stories being created, developed and tracked in an AgileSoC world. I’d welcome any comments on this post, and especially how you are doing your requirements management – especially when requirements are very fluid (which, I’m guessing, is probably most of the time for most of us :-)). A few months ago, I posted on an article on AgileSoC.com titled UVM Is Not A Methodology. The point of that article, was to encourage people to break away from the idea that verification frameworks like UVM truly deserve the label ‘methodology’. That article generated a lot of interest and a few comments. I got some complements from some people and some minor disagreement from a few others. I’ve summarize a few below. Neil, you’ve outdone yourself. Excellent article IMO. We’ll start with a good one :). I got that comment from a friend, a real expert in functional verification and a person I learned a lot from when I decided to specialize in functional verification. I really appreciated that. That isn’t totally agreement but I took that comment as an acknowledgement nonetheless that in order to be complete, a methodology has to go beyond the framework to include some of the things that I identified. The fact that they can’t be standardized is a good reminder that teams using frameworks like UVM need to worry about the extra stuff themselves. No one can do that for them. The article makes some valid points but falls into the same trap that I think a lot of people do; i.e. getting confused between the UVM code library and UVM the methodology … My personal view … is that the customer teams who insist on self-learning the eRM/URM/OVM/UVM library or the (e, SC, or SV) language and won’t ask for training or guidance are the ones who end up getting the least from the methodology…These same users achieve far less reuse and randomisation than they should be getting, and the effectiveness of their testing is much lower than it should be. Where customers have invited me in to help architect their flow … we’ve created some really nice modular environments that are reusable, maintainable and adaptable. These customer teams have become more productive and have then propagated that methodology experience to other teams in their company, much as the article describes. This is the real UVM, where code meets experience … I’m saying this not to boast about…my own abilities, but to stress the point that getting all fired up about a code library isn’t going to make you more productive or effective, there’s a whole lot of hard work and care goes into really building a good UVM testbench. (read the unedited comment here). Again, that comment isn’t total agreement but it does highlight the fact that UVM is larger than a code library and that mentoring plays a big part in how effective teams can be when using it. That one was my favorite! Complete agreement followed up with the accusation of fear mongering! Q. What do you call UVM? Methodology? Framework? Something else?